This week has gone by so fast, I haven't had a chance to get all of the things done this week that I wanted to. I have been busy getting ready for the Thanksgiving holiday here in the States with preparing food and family visiting as well as trying to get some projects done for Christmas. I was able to quickly whipped up this card with the lovely sketch by Kazan this week at 2 Sketches 4 You. It has lots of embossing from my Cuttlebug and embossing folders. I think that I will make several of these to send during the Christmas holiday. 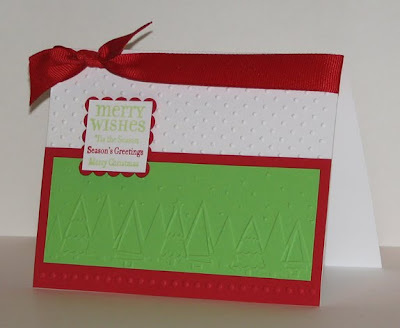 Cardstock, stamp, ribbon, punches: Stampin' Up! Come back Monday for a chance to win some non-fattening blog candy in celebration of my birthday!! Embossing is always fabulous :) and how cool that you are the 100th poster in this weeks gallery!